Regular new production ensures a constant flow of new 20' and 40' shipping containers into our global depot network. Unlike many competitors we typically build standard and high cubes containers in a range of colours. Looking for your specific colour and we can of course arrange this too. 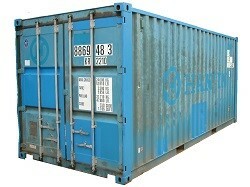 All containers are built today with environmentally friendly water based paint systems. When ever possible we specify eco-friendly bamboo container floors. Sensible high level door handles and a security lockbox are both standard with new containers from TITAN. TITAN also supply new special container types like open tops, half heights, DNV offshore and many types of refrigerated containers. PREFER NEW 1 TRIP CONTAINERS? Good quality used 20' and 40' shipping containers are often an inexpensive here and now solution if you need extra secure storage space. Cargo worthy used containers with valid CSC plates are available worldwide for export or project packing and shipping as shippers own containers. We can normally supply 20' and 40' standard dry van and hi-cubes as well as flat rack and open top containers.